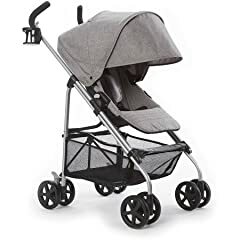 We bought the Urbini Reversi umbrella stroller from Walmart to have as an alternate option to our Graco jogging stroller. So far I’ve absolutely loved it, and would highly recommend it to anyone in need of a lightweight stroller option, but doesn’t want the most basic umbrella stroller. Really helpful; thanks. Much clearer than the directions that came with the stroller. I’m 5’5 and it’s a great height. I think it would be just fine for you at 5′ also! Do you know how much the stroller weight? This is an Excellent review! Very clear and complete. It helped us a lot. Thanks. Also do you think is comfortable to maneuver for a person who is 5 ft ? Since the handles looks very long.. Thanks again. Thank you for such a helpful review! I bought online as our store didn’t carry it in store. Anyone use this for travel? Was it small enough for gate Check? Thank you for posting – it helped me make the decision to get one. Mine is red and I like it a lot. I recently ordered the Urbini Reversi Stroller, Special Edition. Love it so far for my 18 months twins. but the only thing about it is that, when closing it, its a little hard. Or maybe i’m not doing it right? is that normal? Hello am thinking on buying a stroller but i have a toddler almos 2 years do you think hi will fit in it?? Is it worth it?? do the front wheels lock up sometimes when the baby is in the stroller? does the urbini chair attachment come with the stroller? oh you have to buy them separately? thanks! And yes, I think this would be great for a newborn. The different reclining positions would allow for the right angle for a tiny baby that can’t hold their own head yet. I plan on using it with my newborn next year when he’s born!